The Fraxel Re:pair (CO2) laser was recently approved by the Food and Drug Administration (FDA). Clinical trials performed at our Center were instrumental in approval by the FDA. This laser is for rejuvenation of the skin on the face and body. 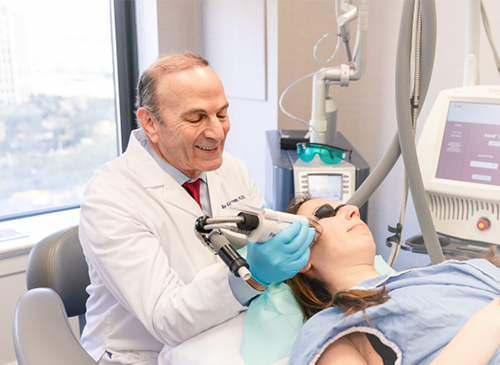 The laser works well for deeper wrinkles, scars, acne scars, and also tightens the skin. Healing generally takes place in five to seven days; however, this varies from patient to patient. For more information on this new technology, please call to schedule an appointment for evaluation and you may also visit the website of the company who manufactured the device at www.fraxel.com. You may also read about New York dermatologists at our office, pleased to offer New York Fraxel Re:pair treatments. Laser Plus Resurfacing Best for Tattoo Removal. Skin and Allergy News, Aesthetic Dermatology (2011). Dr. Elliott T. Weiss is quoted in this article. Dr. Lori Brightman on American Health & Beauty. Celebrity Kendra Wilkinson, Fraxel, and Stretch Marks. American Health & Beauty. (2010).